Peter Baldwin gives us a one-of-a-kind rap-tour of his amazing homestead in Maine! The final video in our series with Rose! In this video, Rose teaches us the wonders of guinea fowl and why everyone, EVERYONE needs one! Rose's Hen House of Clean! Straight out of Lincolnville, ME ... Rose teaches us the easy steps in keeping your hen house clean and its importance! Keep those chickens cluckin'! Check it out, live and in action! Click on the Rally Wagon!!! 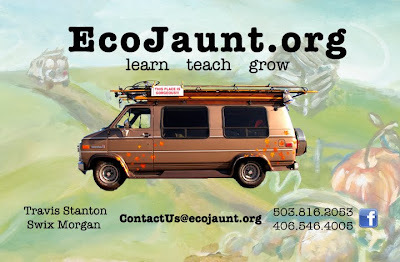 Help keep EcoJaunt going! Support us on kickstarter! Rose of Dolce Vita Farm in Lincolnville, ME shares with us the secrets to keeping your chickens healthy and what to do when they're a bit under the weather! Mikey 'Rutabega' Repkin shares with us the amazing miraculous qualities of the Jerusalem Artichoke!